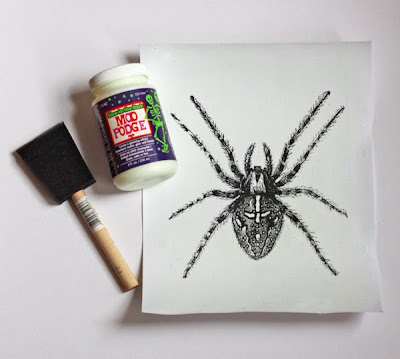 I tried out some Glow-in-the-Dark Mod Podge for this Halloween DIY project. In daylight, prints look normal. In the dark, they glow! At least for a little while. The Mod Podge coating on these needs charging up in light. I was a bit disappointed to see that the glow fades in five minutes or so. But hey, it's a fun five minutes. And I must confess that the photo above is fake. Sorry! It's like I've turned my blog into the National Enquirer. My auto-focusing camera refused to snap pictures at such low light, so I carefully Photoshopped a simulation. I considered adding an alien monkey boy to the image, but opted for realism. The glowing areas on the prints might look slightly more brush-strokey in real life, but this is pretty accurate. If you want to try making your own glowing prints, you'll need white cardstock, a brush, Glow-in-the-Dark Mod Podge, and a printer or black Sharpie. Brush a piece of light-weight cardstock with 5 or 6 coats of Mod Podge, letting each coat dry in between. The paper ends up glossy and sort of leathery feeling. It still looks white, but you can see brush strokes if you hold it in the light at the right angle. Then print out black-and-white images on the treated paper. 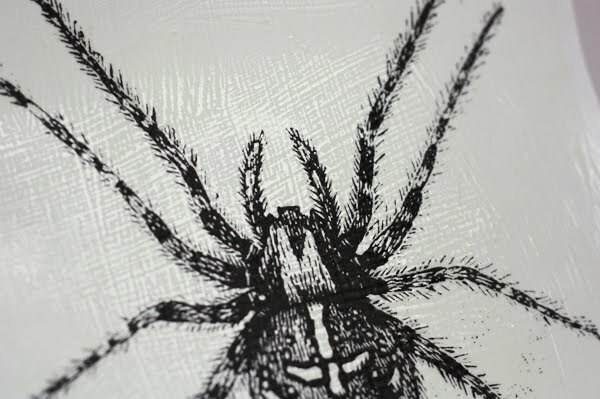 The areas covered by black toner won't glow since the Mod Podge is masked. 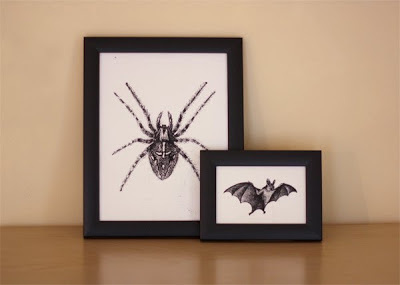 I used the vampire bat and spider from Clip Art Etc., a great resource for vintage clipart. You could also try a black Sharpie, or glue on black paper cutouts. Or brush a canvas with Mod Podge and then paint a black design on top. 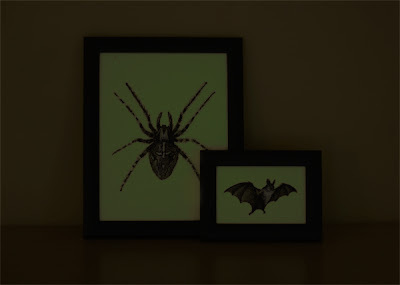 You have read this article halloween / tutorials with the title Make glow-in-the-dark Halloween art. You can bookmark this page URL http://jenkrebs.blogspot.com/2012/10/make-glow-in-dark-halloween-art.html. Thanks! No comment for "Make glow-in-the-dark Halloween art"